Jules and Jeff come to visit us on the boat in Fort Myers. One of the joys of the start of the cruising season is seeing old friends. Another is making new friends. We stopped in Jacksonville on the way down to see Captain Robert. He and his family spent last summer in Scotland. And he is planning some big land adventures now. Check out his book Water Power here. At our initial arrival in Indiantown we looked up Ellen (from Tikity Boo). We met her and her husband Scott last year. They had just bought the boat and took it to the Abacos for a shakedown cruise. Now Scott is off for a while making money, and Ellen gets to deal with the boat ownership problems. Where’s that confounded leak?!? Shortly after our arrival we heard from Chris and Liz (From Groovin’). They came down from Toronto and stayed with us a while before moving their boat into the work yard. We were all busy, but did make time for a couple of nights of guitar picking. Kevin and Chris (from Apres Ski) came down from upstate New York as they have been doing for years. We now have a annual tradition of swapping suppers and stories about making economical boat improvements. Haven’t seen Jules and Jeff in years. Luckily, they are in Naples. 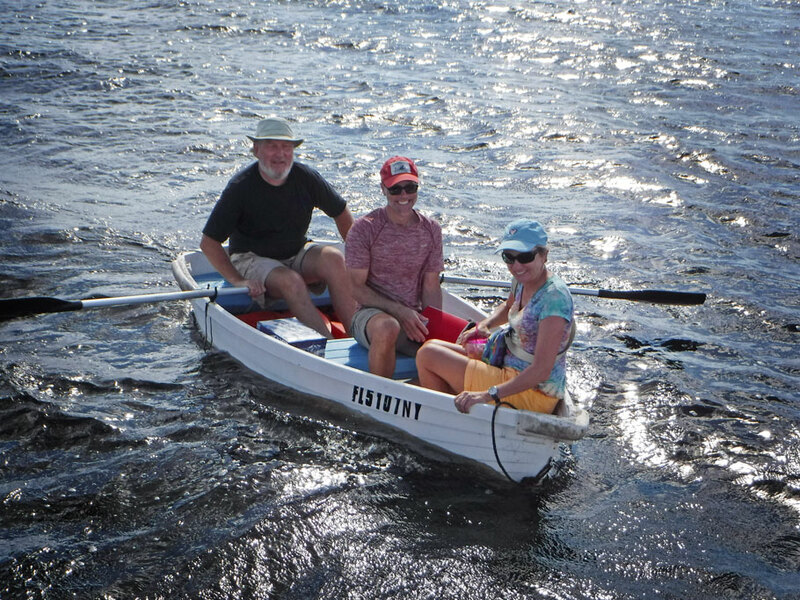 They drove all the way up to Fort Myers to row out to Blue Wing. We spent a great afternoon catching up. 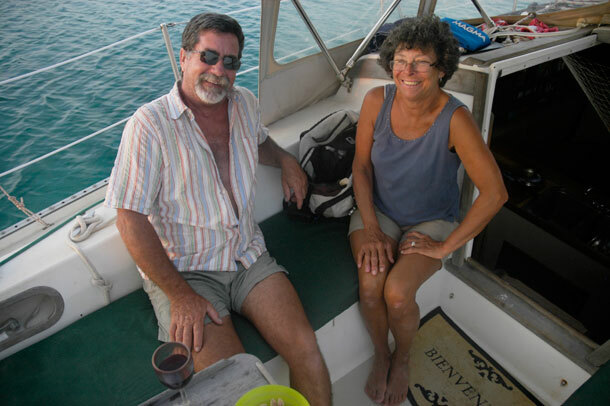 They are selling their mono-hull (Kismet), and upgrading to a 44′ catamaran. The one they wanted was in Encino, CA. Pay to have it delivered? Heck no. Just decide to live the next couple of years on the west coast! 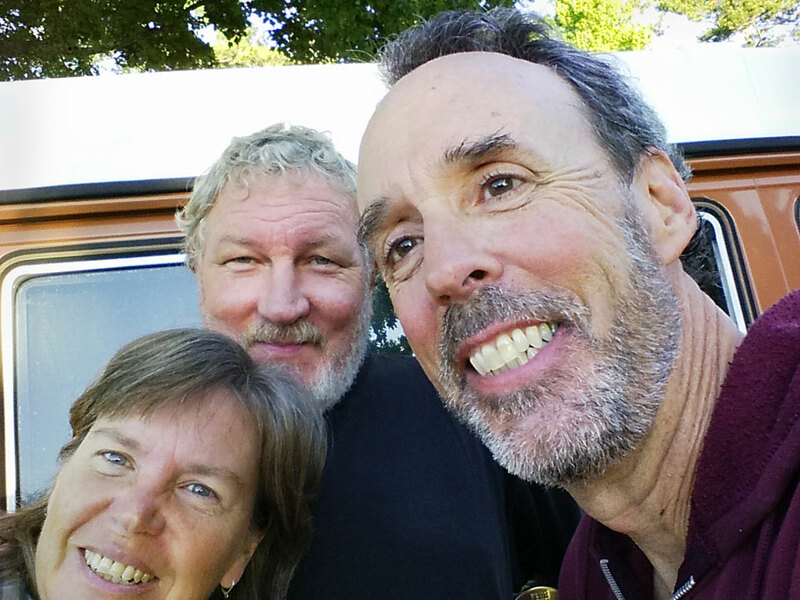 Our friends Don and Patti (from Silent Wings) live near Fort Myers. We hung out at their house and spent one evening. I, for one, sure enjoyed taking long hot showers there. They are delaying their cruise until March. Can’t start from Puerto Rico and do the Caribbean islands until after their African photo safari in February. We haven’t seen them, but Sid, Kate, and Bo are heading south from Puerto Rico in Quest this season. Dave and Trish are leaving St. Maartin in Miss Grace getting ready to cruise Caribbean islands also. Our friend Brenda from Hobe Sound is about to experience the joys of retirement. I see lots of kayaking in her future. We have corresponded with other friends, but our wakes haven’t crossed this year. Who knows? It may be years before we see some of you. And it’s possible we may never see each other again. But stay in contact. You are on our mind. I find it interesting that Greg wanted to write this post about friends. You know, friends seems like kind of a touchy feely topic. I mean you donâ€™t go documenting your friendships in a blog for the world to read unless you have some emotion, some feeling for those friends. At least, I wouldnâ€™t. I love my/our friends. In my life I have had lot of good friends, many who belong to scenes or communities I have been a part of. In my teens and early twenties they were the punk rockers in St. Louis, in my thirties they were the people I met through another music scene centered around a live performance club in Greenville, SC, The Handlebar, and in my forties I found community in a old historic mill neighborhood in Atlanta, Cabbagetown. When we went off to live on the water I had mixed feelings about leaving my friends, my community behind. But I had also been reading books and blogs and what not on line that assured me that I would find new community, that in any anchorage I would have dozens of friends and acquaintances and when I weighed anchored and followed the magenta line to the next stop I would meet even more people and/or run into friends I had met days, weeks or months earlier. This was a lie. It isnâ€™t that easy â€“ well, at least, not for me. Having sailing or boating in common with someone and being anchored in the same place is along the lines of having the commonality of living in a house in the same city. Lots of different people live in houses. Just because I live in a house and you live in a house doesnâ€™t mean we will be friends. And then there is this â€“ it is just hard when you move all the time. It takes time for me to get to know someone and probably especially for them to get to know me. Sometimes you meet someone who you feel like you click with, but you donâ€™t get a reciprocal vibe. Sometimes you meet some you really like, but donâ€™t get their contact info before you part ways. Sometimes people arenâ€™t looking for new friends. Sometimes it is just hard to keep up with people once you move on. Sometimes you feel like you are back in high school wondering if they really like you, are you cool enough? We have been on the water for 5 years now, we have extended our friendship and comradery many times, and some times those extensions of friendship have been picked up and extended back to us. 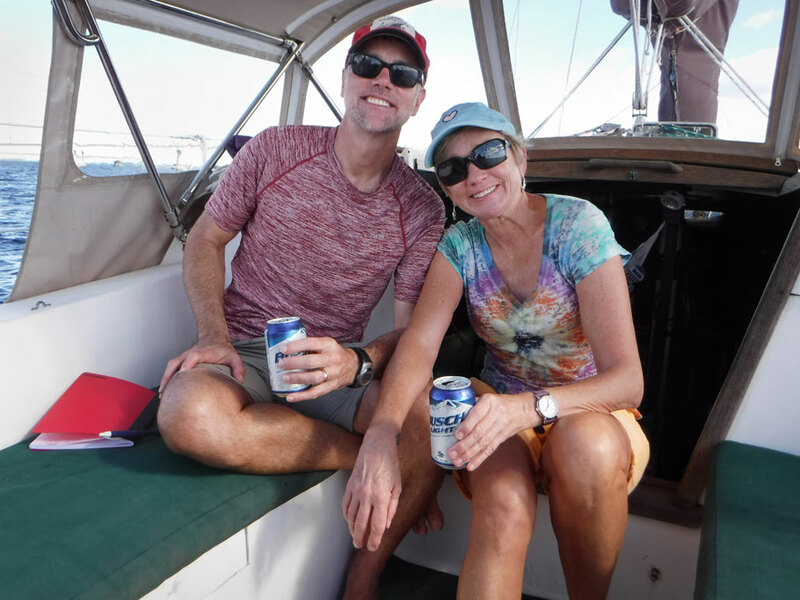 Now, through our little nomadic adventure, we have a handful of boating (and land) friends that we keep up with on Facebook, who we see in Stuart, and are in contact with periodically by email. I am not sure if we will ever see some of these people again in person, but I know mostly where they are and where they are going, and sometime, somewhere out there, maybe by accident or maybe by intention, our paths will cross again. PS – While we are on the topic of friends and meeting new people, we met some land travelers last December who came to visit and interview us on Blue Wing for a web series they were making on modern nomads. The series was just completed and published this past week. You can see the series here. We have lines in each of the five videos, but are featured in the third one, Van Life EP3 – How Do We Work? Captian Robert lives in Jacksonville, so we get to stop in on him and his family a couple a times a year when we travel from Stuart to Atlanta and back. This pic is from a visit last May. 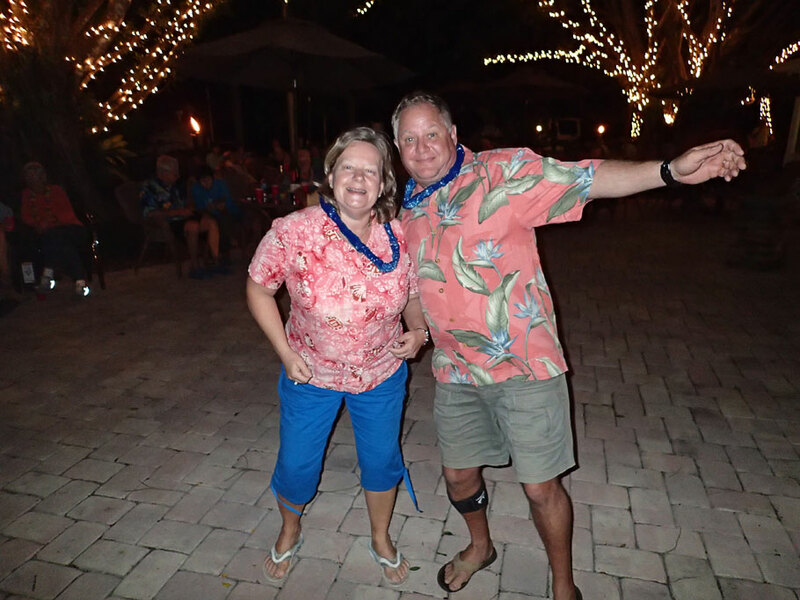 This is a show of Chris and Liz from one of last year’s Indiantown Thanksgiving week party. Ellen is figuring out how to live the life on her own while her husband, Scott, is away working. Here she is posing with dock hand Alex. Jules and Jeff on Blue Wing. 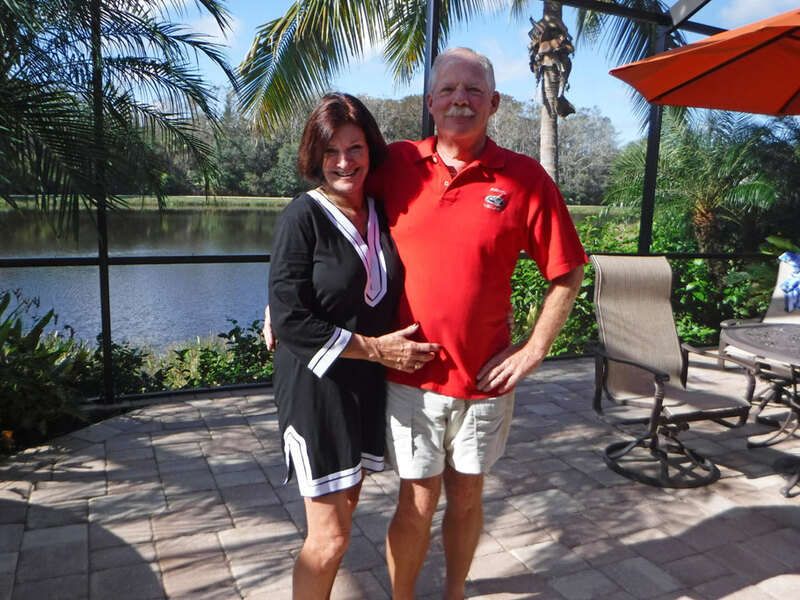 Don and Patti in their beautiful home in Fort Myers. A pic from a few years ago when we ran into Chris and Kevin (after previously meeting them in Indiantown) in the Bahamas. This entry was posted in Life on the Water and tagged Sailing Friends. Bookmark the permalink. Great post, and not just because we are a part of it. We have a fistful of friends that we are sure we will eventually cruise again with (you included), but those times are far between. It can get lonely. Group websites help, as do happy hours and pot lucks, We are looking forward to hanging in a marina in Mexico for some months this year, and will hopefully make some new sailing buddies. Have a wonderfull 2016–come see us on your camping excursion!! !